On the first Sunday in September we had the first ever Odiham Raft Race. Seven teams competed over a course that started at the North Warnborough lift bridge and ended some 2km East at Colt Hill. The fastest time of just over half an hour was set by the BCA team (right, and below right), thanks to the muscle power of four rangers and a cunning raft design that featured a wooden framework wrapped in layers of, yes, clingfilm. It looked flimsy but “Raft for Life” was very stable and inexplicably held together; well done Mark Foster, designer, builder and paddler. Second fastest time, 47 minutes, was logged by “In Deep Ship”, just beating “BAD Idea”, the Basingstoke & Deane Canoe Club entry; the club also did a great job of providing canoe escorts for all the rafts. Fourth place went to the Galleon Marine entry “Blues & Twos” after surviving a capsize before they had even started. Just behind them came another two-man crew aboard the “John Sinkerton”, finishing well despite its name and a very low freeboard. Last in were the “West Street Wafters” and “Crafty Bu**ers”, who might have gone faster if their beer supply hadn’t run out. Finally, there was a short race for children’s teams, with BAD Idea doing well again, hotly pursued by the West Street Wafters. A trophy for the winners and medals all round were presented by Air Chief Marshal Sir Joe French, one-time Commander-in-Chief of RAF Strike Command (right, with the winning team). A great crowd turned out to watch the fun (below) and there seems to be plenty of support for making this an annual event. 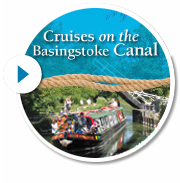 Thanks are particularly due to Odiham Parish Councillor David Stewart, whose idea it was, Philip Riley, Chairman of the Basingstoke Canal Society, and Fiona Shipp, the Canal Manager, for allowing the lunacy to take place! A special thanks should go to organisers and sponsors Arthur and Karen McCaffery of Galleon Marine for all their hard work preparing for and promoting the event. Arthur declared the day “a fabulous success”. Thanks to everyone who took part – more than £500 was raised for the Canal Society to benefit the canal. For lots more photos and race report , see the Galleon Marine Raft Race website, and the newpaper report here.